Attenborough consistently reinforces the horrors of war by depicting not only the disasterous military engagements and their toll on heroes, but also the witless political decisions that led to needless, excessive loss of life. 177 min. United Artists. Director: Richard Attenborough. Cast: Dirk Bogarde, James Caan, Michael Caine, Sean Connery, Edward Fox, Elliott Gould, Gene Hackman, Anthony Hopkins, Hardy Kruger, Laurence Olivier, Robert Redford, Liv Ullmann. 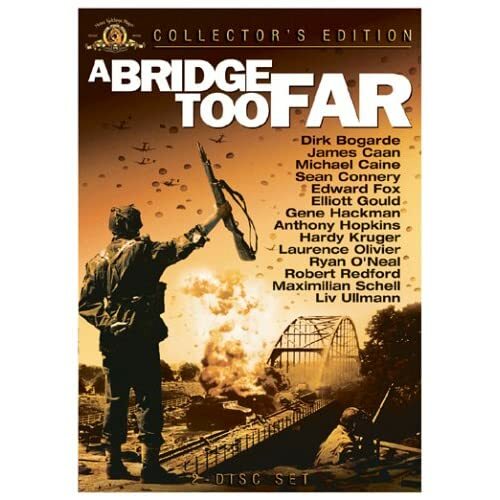 Fox got a sequel of sorts to The Longest Day—fifteen years later—in Richard Attenborough's A Bridge Too Far. Like The Longest Day, A Bridge Too Far is based on a history tome by Cornelius Ryan and assembles a star-studded cast to inhabit a three-hour account of a significant WWII battle, shot on authentic locations. While producer Darryl F. Zanuck lamented not striking the decisively anti-war note he intended with The Longest Day, Attenborough's film certainly succeeds in this regard, even while celebrating the heroism of the men put in harm's way. Attenborough's film also offers more than cameos to its top-lined fourteen stars. Determined not to delay yet another offensive, Lieutenant Gen. Frederick Browning (Dirk Bogarde) ignores doubts and deterrent military intelligence. He lays out Operation Market Garden to its key players: "We're going to take 35,000 men 300 miles and drop them behind enemy lines." British Maj. Gen. Robert Urquhart (Sean Connery) and American Brig. Gen. James M. Gavin (Ryan O'Neal, seriously outclassed) will lead their paratroopers to take a road and five bridges through Holland into Germany. Lieutenant Col. John Frost (Anthony Hopkins)'s paratroopers must play a dangerous waiting game as they attempt to hold the "farthest" bridge, in the village of Arnhem, until reinforcements and resupply arrive. British Lieutenant Gen. Brian Horrocks (Edward Fox) and British Lieutenant Col. Joe Vandeleur (Michael Caine) bring up the rear, theoretically taking advantage of cleared roads. Screenwriter William Goldman (All the President's Men) does a solid job with the narrative juggling act, faithfully rendering Cornelius Ryan's generally accepted account of the battle—that historical fidelity is the film's greatest asset. If a few of the dramatic vignettes along the way play a bit corny, they also sustain interest over the long haul by putting dramatic tissue onto the skeleton of the plain facts of Operation Market Garden. The film's most damaging element is John Addison's bafflingly counter-productive score; the music keeps trying to patriotically pump up a mood that's otherwise one of tense anticipation and dread (a shame, since Addison eagerly intended it as a tribute to fallen heroes). Still, Attenborough consistently reinforces the horrors of war by depicting not only the disasterous military engagements and their toll on heroes, but also the witless political decisions that led to needless, excessive loss of life. 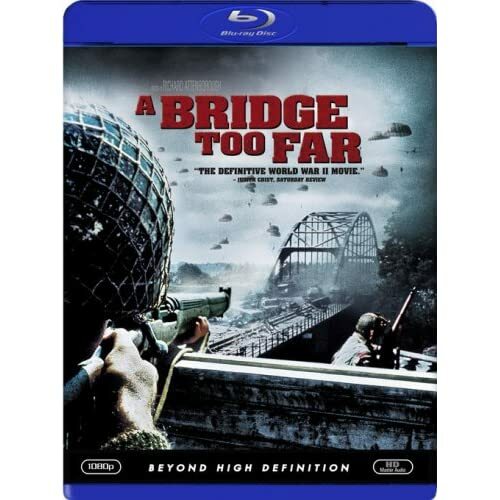 Fox's Blu-Ray upgrade of A Bridge Too Far does the best it can with the film's diffused photography, a product of its time (briefly, during some later scenes, there's also a veil-like appearance creating some faint vertical striations); once one's eyes adjust to the soft look, the transfer is a very pleasing one, offering as much detail as there is to offer and looking as good as the film is likely ever to look. A 5.1 Master Lossless Audio soundtrack does a great service to the soundtrack. 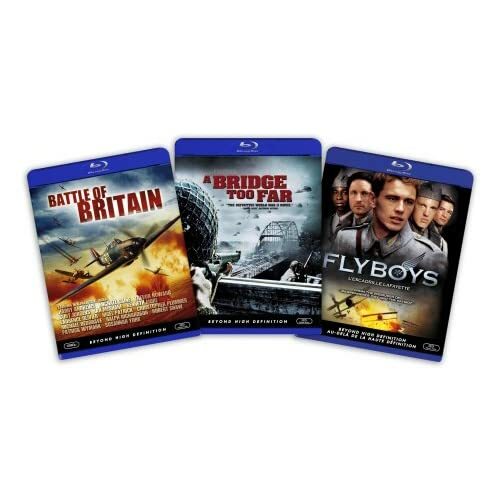 Unfortunately, the only bonus feature ported over from MGM's 2-disc DVD Collector's Edition is the film's Theatrical Trailer (3:17), though trailers are also included for Platoon, Flyboys, and Windtalkers. All site content © 2000-2019 Peter Canavese. Page generated at 04/25/2019 02:49:51PM.